A few years ago, researchers from Lund University in Sweden were working to figure out the mechanism behind the orientation skills of nocturnal, ball-rolling dung beetles1. These beetles manage to move in impressively straight lines when they’re trying to get away from the competitive chaos of the crowds around the dung pile. The researchers approached the question through a series of clever experiments. For example, they built a dung beetle arena inside a planetarium and manipulated the star map to create their very own patterns in the night sky. They discovered something very cool: the dung beetles were using cues from the night sky to find their way — something that had been shown for birds but never before for an insect. But the most interesting thing was that their main cue appeared to be the Milky Way itself. If you’re standing in the centre of a city, looking up at the night sky, odds are you’ll have trouble locating the strip of densely scattered stars that marks our galaxy. Those of us that live in urban environments might be able to see some of the brightest shining stars on clear nights, but most of the night sky is obscured by what we call skyglow: the diffuse illumination of the night sky by a scattering of light from artificial sources. While there is no study to date that has addressed whether artificial light can cause problems for the stargazing dung beetles, we are being made increasingly aware of the negative impact that the disappearance of darkness can have on the lives of many organisms. The night-active dung beetles are only one example — albeit an especially beautiful one — of natural light playing an important part in an organism’s everyday life. In fact, the lives of most organisms on Earth are tightly regulated by some combination of daily, annual, and sometimes lunar light cycles2. One very important role that light plays is in making sure that everything happens at the right time, biologically speaking. On a day-to-day basis, light cues control the activation of specific enzymes in animals and plants, the opening and closing of flowers, the onset of singing in birds and, importantly, they tell animals when it’s time to go to sleep. Over a season, changes in light patterns can let an organism know that it’s time to migrate, reproduce, or hibernate. Artificial light messes with these cues in different ways, and the consequences vary in their severity. On a large scale, persistent night-time light sources contribute to the skyglow mentioned earlier, which can obscure the night sky for animals that use celestial cues to navigate. But these consistent alterations of light availability also have an impact on a smaller scale, where they can upend entire ecosystems, mainly through the disruption of biological timings. There are examples of day-active animals that have extended their foraging activities into the night, due to the presence of artificial lighting in the area. The extended foraging time means that they are suddenly brought face-to-face with nocturnal foragers. These nocturnal animals then have to compete with the newcomers for food, and do so in light conditions that they are not used to. Similar to this, artificial night lighting can make it easier for day-active predators to locate prey even at night. This can lead to disruptions of predator-prey relationships that are important structures in most ecosystems. Changes in the onset of singing in birds, and consequent changes in breeding success for some species, are another important and fairly well-documented result of artificial nighttime light3. Light pollution has received more attention in recent years, with several collaborative programs being set up to tackle the problem and aiming to build a solid knowledge base. 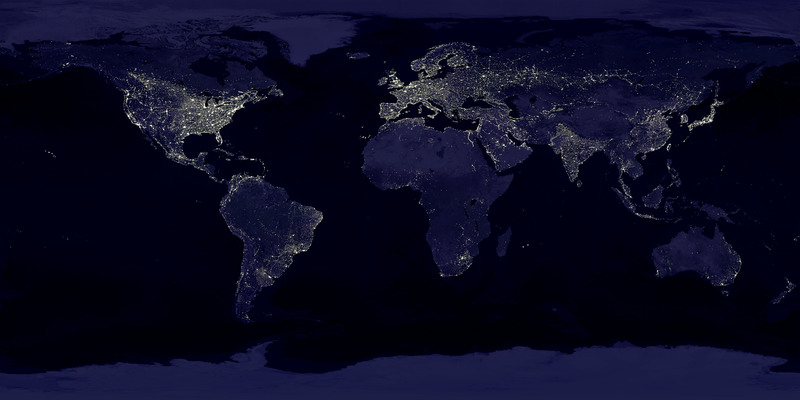 The International Dark-Sky Association is the biggest global authority on light pollution, with a stated mission to “protect the night skies for current and future generations”. They work with the public, city planners, legislators and the lighting industry to ensure that a chosen lighting regime is smart not only for us humans, but for the surrounding nature as well. The Loss of the Night Network is a European interdisciplinary research program that aims to increase our understanding of the reasons behind our increasingly illuminated nights, and the consequences it has for human society as well as natural ecosystems. With the results from their research, they’re hoping to ensure the development of lighting concepts that have as little negative impacts as possible. We’re beginning to grasp the smaller-scale effects of artificial lighting on the behavior and physiology of a wide range of organisms, but our knowledge gaps are still large. For example, our understanding of the effects of skyglow is still fairly poor, despite the prominence of this phenomenon in cities worldwide, and the consequences it might have for animals living in or near urban environments. We also know surprisingly little about the impacts of artificial lighting on sleep. Given the importance of sleep for the health and recuperation of most animals, this is a research area that will undoubtedly receive more attention in the years to come. In the meantime, we have the International Dark-Sky Association, the Loss of the Night network4, and numerous other like-minded champions of the night that are working hard to give back a little darkness to the world. 1Dacke, M, et al. 2013. Dung beetles use the Milky Way for orientation. Current Biology 23: 298-300. 2Gaston, KJ, et al. 2017. Impacts of artificial night at light on biological timings. Annual Review of Ecology, Evolution and Systematics 48: 49-68. 3Kempenaers, B, et al. 2010. Artificial night lighting affects dawn song, extra-pair siring success, and lay date in songbirds. Current Biology 20:1735-1739. 4Light at night done right – A user guide for outdoor illumination respecting the environment, our health and taxpayers’ money. Statement of the EU COST Action ES1204 LoNNe (Loss of the Night Network). Link.